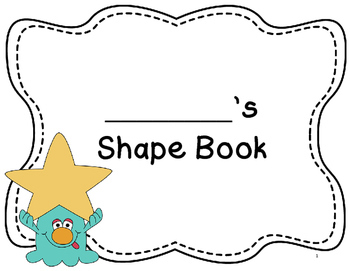 My Shape Book & Shape Monster (Grade 3 Geometry)-No Plan Unit! 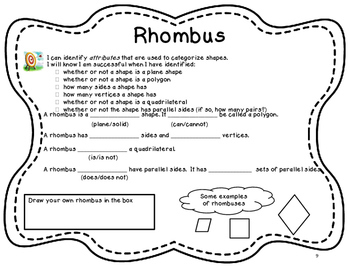 This is a great 35 page workbook for students to complete a unit on shapes in grade three. 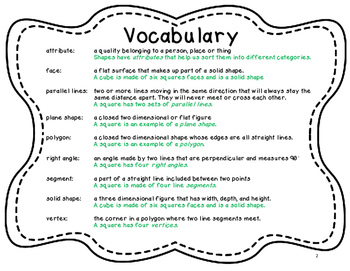 Use it to guide your unit, for second graders that need enrichment, or independently for fourth graders that need some review. 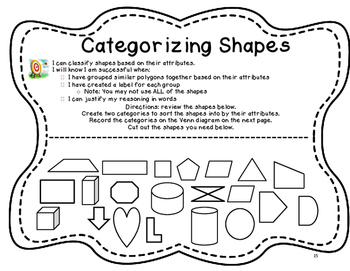 This book has multiple learning targets and take students from sorting plane vs solid shapes, polygons vs. non polygons, discovering what a quadrilateral is, identifying attributes of specific shapes, solving and writing shape riddles, partitioning and labeling shapes and areas, and creating a fun shape monster at the end for an anchor project that also reviews adding and subtracting 3 digit numbers, multiplication, associative property, division, place value, and even vs. odd numbers. Print this book and your entire unit is planned! 3.G.2 . Partition shapes into parts with equal areas. Express the area of each part as a unit fraction of the whole. For example, partition a shape into 4 parts with equal area, and describe the area of each part as 1/4 of the area of the shape. Check out my website www.wishuponaclassroom.com for more great ideas!